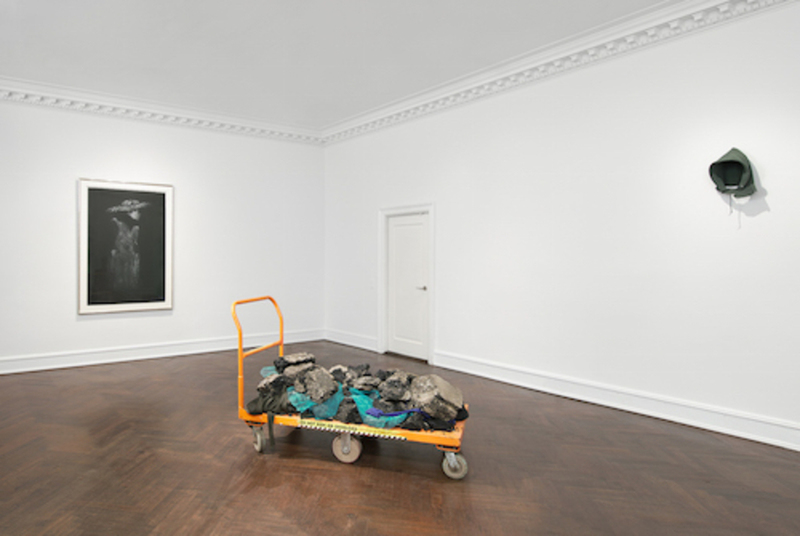 View of “David Hammons,” 2016. In the catalogue that accompanies this show, there is a photo of the artist David Hammons in Harlem in 1980. From behind a pair of sunglasses, he is reading Tales of Power (1974), a volume in Carlos Castaneda’s account of the teachings of an indigenous Mexican shaman. Though presented without comment, the photo is a winking nod to Hammons’s reputation as a kind of art-world sorcerer and also to his own anthropological interests: For five decades he has deployed conceptual jokes and everyday materials to reflect on the paradoxes and complexities of African American life. Although by no means exhaustive, this exhibition offers an important opportunity to survey the artist’s career, including his early “body print” Spade (Power for the Spade), 1969, and his sardonic riff on Minimalism, Untitled, 1989, a sculpture of fortified-wine bottles. Inevitably reframed by the discourse around the Black Lives Matter movement, the show hits hardest with In the Hood, 1993, a severed hood of a black cotton hoodie—the supposedly “hood” garment that Trayvon Martin dared to wear while walking in a Florida suburb. Hung high on a wall, it connects contemporary black bodies to the histories of both lynching and trophy hunting, and suggests that art collecting itself is a blood sport. Though no stranger to success, Hammons remains elusive, and his work is marked by a similar resistance to being visually mastered: Veiling, hiding, and obscuring are rampant here, and the tension between presence and absence in works like In the Hood speaks to the dangers of both visibility and invisibility, in life as in art.